This week in movie class, I only had two kids, because our third guy was sick. After last week’s class on Writing Action, JS and Miss I brought their scripts, now with actions included. As I knew I was only going to have two kids, I decided to do something to make the difference between writing action and writing dialogue more clear to them. JS is very good at breaking down the story to its core structure and elements, but needs to work a bit on the details of what populates that structure. Miss I, on the other hand, gets lost in the details, and has a hard time seeing the bigger picture. 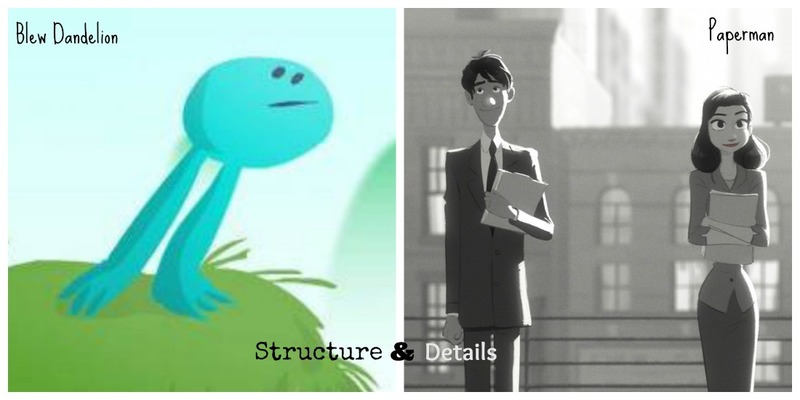 I created an exercise for them to have them learn more about Structure and Details in a story. I had them both watch a short film on their own, then tell the other one about the story they had just seen. After they told each other their stories, we all watched the shorts together and compared notes. JS saw Manny Hernandez‘s Blew Dandelion, an animated short from Calarts. This is what he described what he saw. This is the actual video. Next, Miss I described Paperman, a Disney produced animated short by John Kahrs that was nominated for the Academy Awards as best animated short. This was her take on it. And here’s the actual link to the short. It was very interesting seeing how JS realized the amount of details he had left out. And it was also very interesting seeing how Miss I came to understand that she had left very important aspects of the story by trying to catch every little detail. It was also very interesting seeing them realize they could tell a whole story without the need for dialogue. Before watching the shorts I asked them if they thought they could tell a story without dialogue and they both thought it was impossible. TV tends to be so over-dialogued (specially for younger kids) that it becomes hard for them to picture a story told by actions and images alone. Next week I hope to have my whole class again, and one more we’ll go over the difference between structure and details in a story. I also hope we can finally start story-boarding their scripts — which is the perfect way to make them start thinking in images, not just words. If I can storyboard with my little stick-figures, anybody can! « Princess Madeline Trilogy Cover Reveal and $25 Giveaway! I can’t wait to show these to my kids after school tomorrow!!! Love it! !